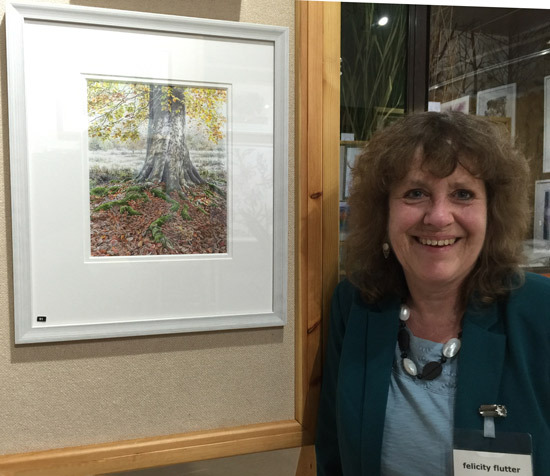 I thoroughly enjoyed myself at the Private View for the 2016 Florum Exhibition on Friday evening. 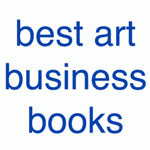 It's not just that it has some wonderful artwork and the best ever hors d'oeuvres (better than professional caterers!) - but the people who organise and the artists who participate in it are such nice people! 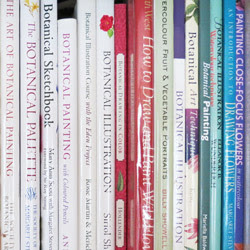 the fact that the Society of Botanical Artists are having to change their exhibition to the autumn next year and that means two exhibitions involving too many of the same people too close together. the decision by a number of members who have been running it for many years to take a break. Will they be back or will there be a new set of members on the organising committee? - we'll just have to wait and see! So we shall wait and see whether Florum resurrects itself and if so whether it's at a new time of year and maybe at a new venue with new organisers. Who knows? I sincerely hope it will keep going as it's a delightful exhibition and sales are always very brisk! 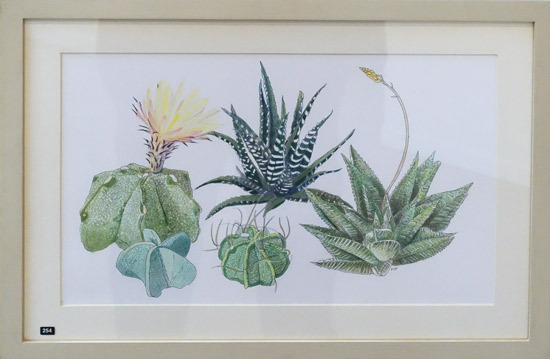 The aim of the exhibition is to create artwork inspired by plant life. 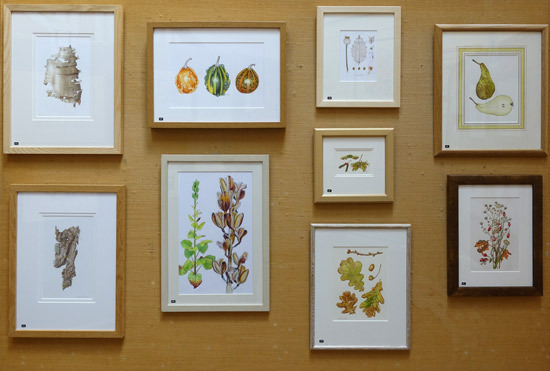 It's emphatically not a "strictly botanical" exhibition but that makes it all the more appealing to a wider range of visitors. The exhibition maintains its normal high standards although I think I might be right in saying there are fewer works being exhibited this year. I do know that last year there was a surge in larger works creating a complete nightmare for those designing the hanging - and this might be the reason. I'll be putting a slideshow together of the exhibition. However this takes a little time to prepare so below you'll see some of the images from the exhibition. 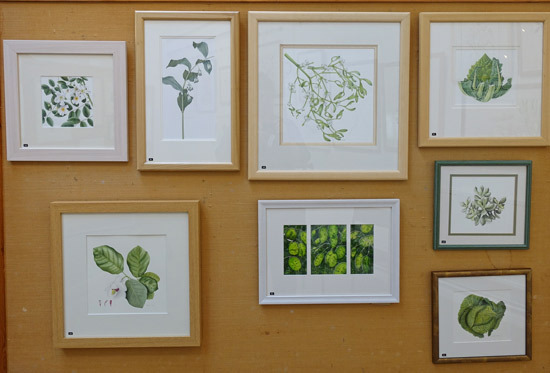 You can see more photos of the artists with their artwork on my Botanical Art and Artists Facebook Page (which you can see irrespective of whether you have a Facebook account - however you can only comment if you are on Facebook). The exhibition includes a number of new artists. 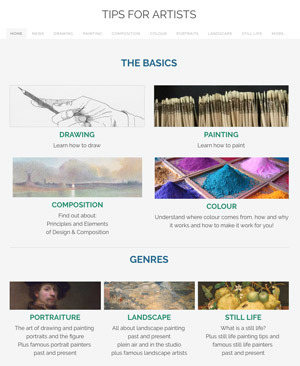 Each artist's name contains a link to their website or a site related to the artist. 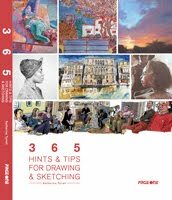 The list is interspersed with artwork by the artists - and photos of the artists with their artwork! 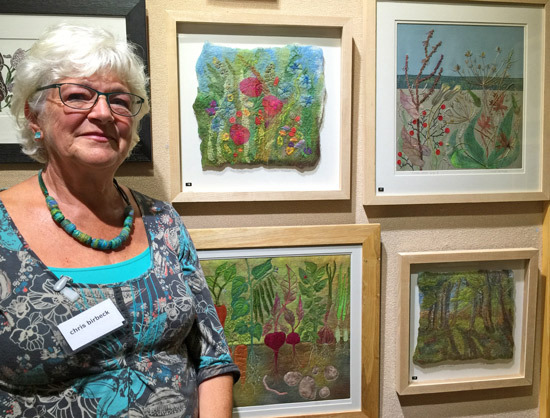 Chris Birbeck - a new exhibitor whose felted and textile embroidered artwork was universally admired. 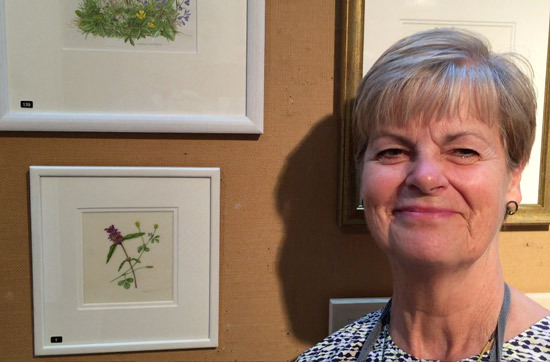 Chris is an art teacher who began making art using textiles after she retired. I enjoyed her explanations of she makes her work which she creates using experimentation and developing new techniques using hand and machine stitching. 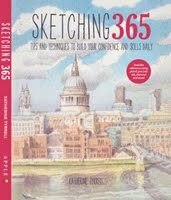 She starts with drawing and what she finds in her garden and the landscape around her home. 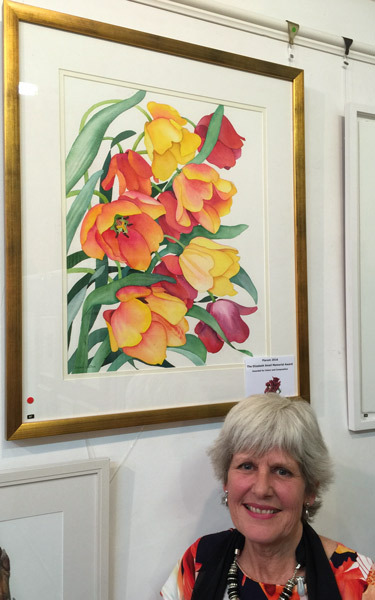 All the money raised through sales of her artwork goes to Cancer Research UK - and her art business is called Heartfelt! Tsuyako Elliott - Tsuyako has previously exhibited with Florum as a student of Mayumi Hashi, but joins this year as an artist and newly elected member of the SBA. She painted the tulip tree which you can see in the image at the top of this post. Felicity Flutter - exhibits regularly around Kent and the South East. 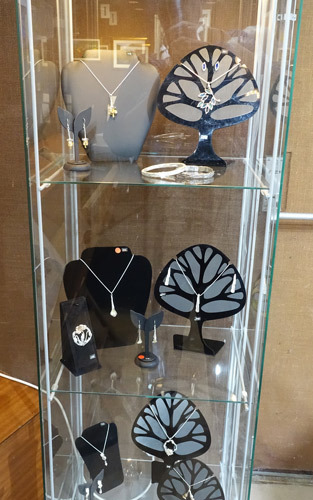 She is a a committee member for South East Open Studios. 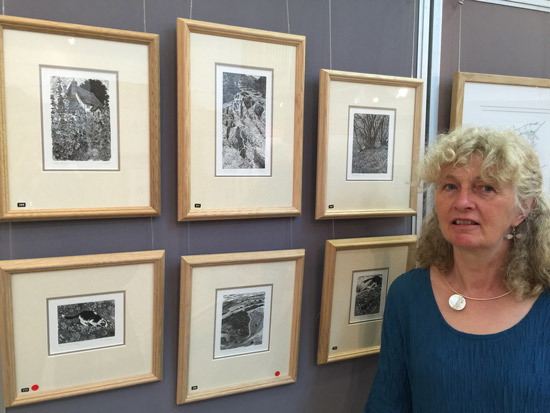 and the Cranbrook Art Show and an associate member of The Society of Graphic Fine Art. I was impressed with her detailed portrayal of a tree in autumn which highlights the difference between leaves on the tree and the ground. 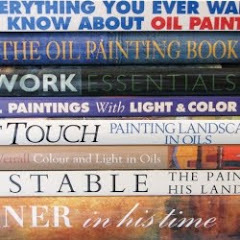 Amber Halsall - always creates a splash of colour! This time it's based on Daniel Smith's Moonglow paint created from a blend of three pigments producing an unusual colour range. 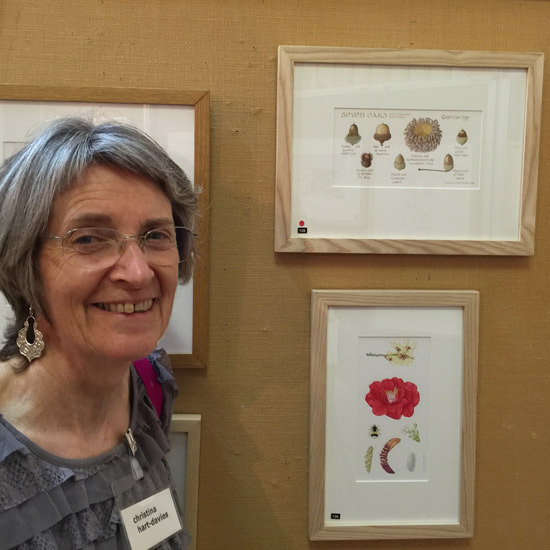 Helen Hanson is one of the organisers of the Florum exhibition. 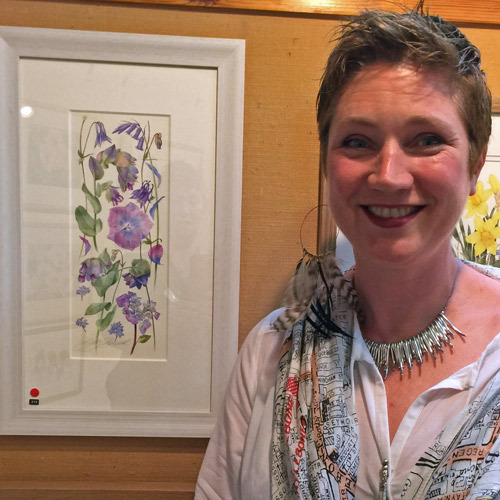 This year she is exhibiting her Kentish Spring Series which you can also see on her website (where four are also available as prints). 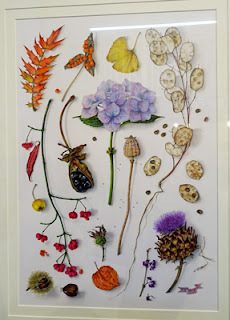 Christina Hart-Davies - Christina's new book A Wild Plant Year is available to buy at the exhibition - and one of her paintings is coming home with me! 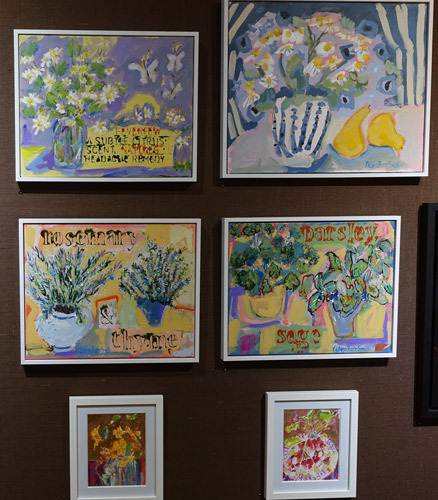 I observed to her that including a painting about "Seven Oaks" was going to more or less guarantee a sale given the location of the exhibition. Christina grinned (you'll note the red spot!) and said she's found it's worked well in the past. Each time she finds a new way each time to portray seven oaks. It's a point worth remembering for those exhibiting. 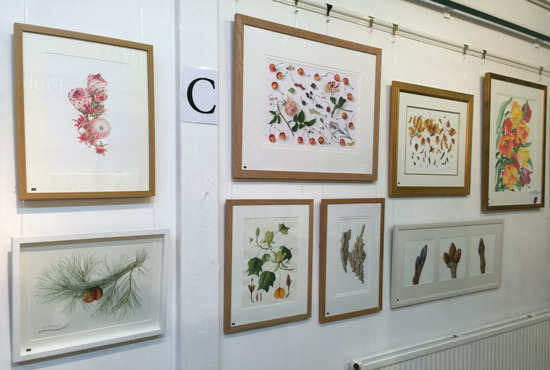 It's always a good idea if you have artwork which ties in to the locality of the exhibition - especially if it's one which gets a lot of visitors! 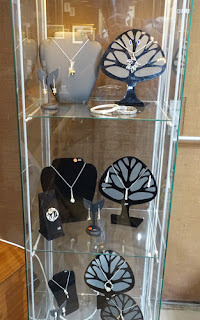 Mayumi Hashi - born in Japan, Mayumi now lives in Kent. 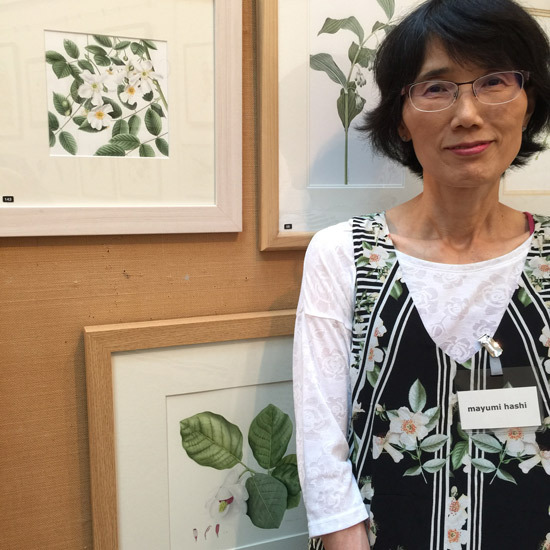 You'll be able to see more of her paintings very soon in the Flora Japonica exhibition which opens at the Shirley Sherwood Gallery at Kew very shortly. 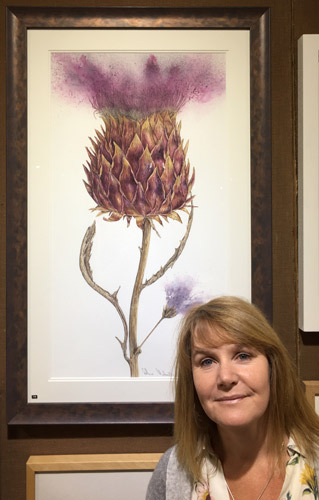 Sarah Morrish - displaying the winter buds which she exhibited at the RHS earlier this year. 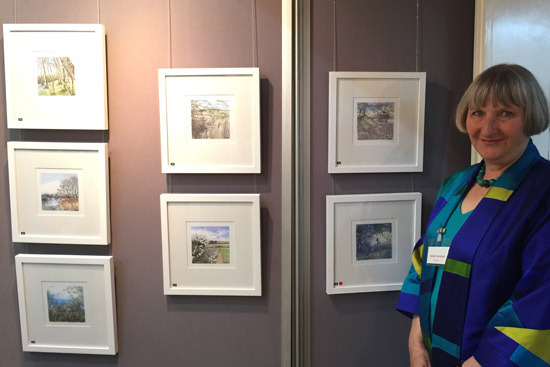 Vicky Oldfield - her artworks (Collagraph, Chime Colle and Watercolour) continue to impress! 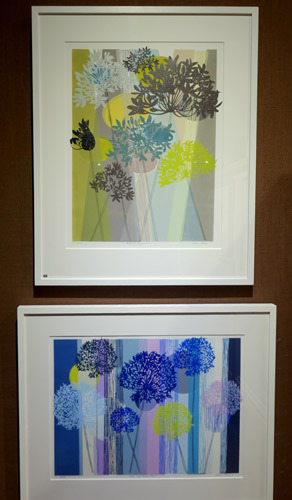 Tessa’s bold abstract prints are mostly original monotypes using oil etching inks, built up in many layers and richly textured with additional elements of collage, hand painting and individual laser cut woodblock printed imagery. 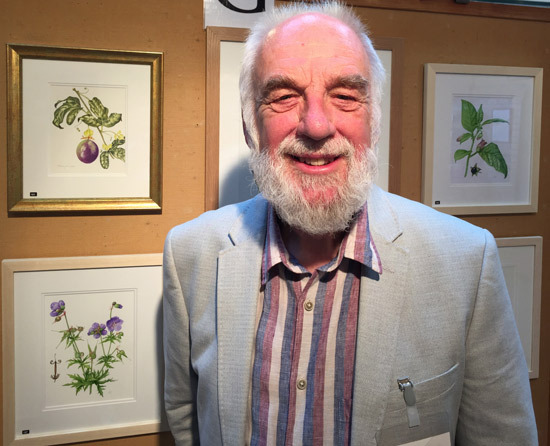 Roger Reynolds - Roger won a Gold Medal for his botanical artwork at the RHS earlier this year. 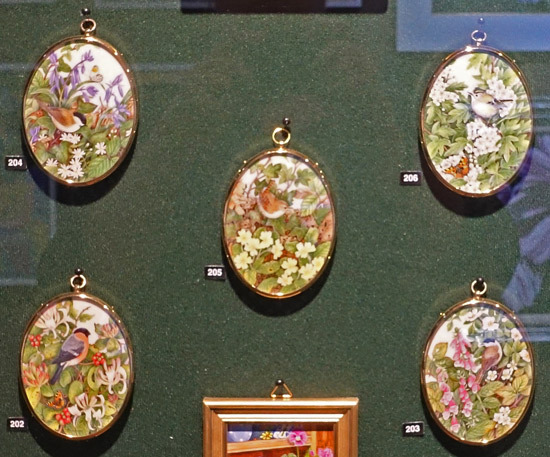 Joyce Rogerson RMS SBA HRSWA - I've seen Joyce's work over many years and she always produces delightful compositions and miniature work of the very highest quality. 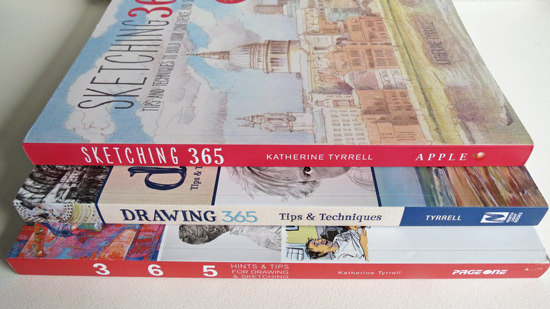 Katherine Tyrrell - that's me! 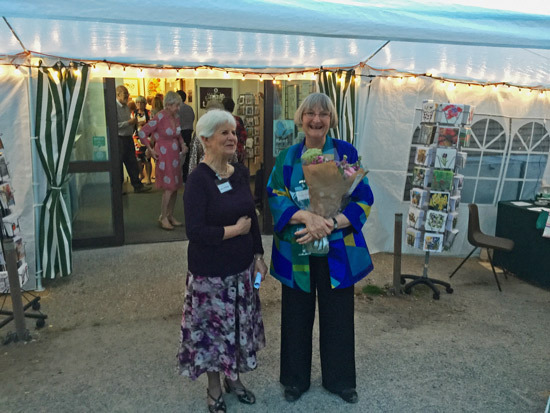 the Private View had opened! 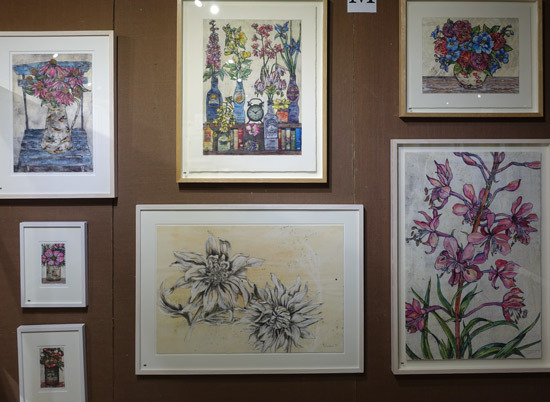 You can also see examples of the artists exhibiting on in three galleries on the Florum website: gallery one; gallery two; and gallery three. 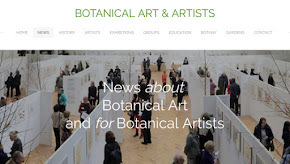 Given that we don't yet know when the next exhibition of Florum will be - or indeed if there will be one - I thought it appropriate to record all my previous reviews of Florum exhibitions that I have attended. Here's hoping we have more delightful Private Views in future! Sue J Williams and Helen Hanson on a brief break from logging sales and distributing red dots! 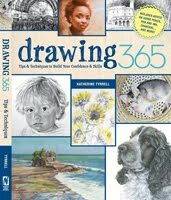 What a fabulous exhibition and such a high standard of work. I wish I lived nearer so could go along.